This is the armor that Edwin VanCleef's wore. Unfortunately, unless you were into keeping sets for looks a long time ago, you won't be able to complete the Van Cleef look. This set uses the Black variant of the "D2 Leather" artwork and forms a complete seven-piece set of the art, though the only boots are actually no longer available. Very sadly there are no boots of this colour and artwork available in the game. :( You would have had to get Bottes de déplacement before they were removed. Note that one of the listed chests is a short-sleeved version: Cuirasse de la pierre tombale, but is also now out of game. The three sets of listed gloves also all use differing models (but all the same artwork), so check them out to see which style you prefer. Griffes d'osselets de Krân are chunkier and Gants tempétueux have floppy tops. Luckily for me I kept Bottes de déplacement and I have found a nicely fitting helm for the rest of the set Voile de traqueur du ciel. 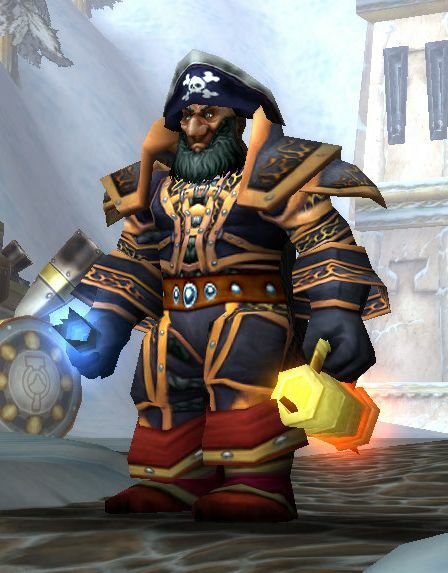 I think Blizz should bring this back, instead, sold from the LW vendor that also sells the Stormshroud Pants Recipe. If you are a Troll, Tauren, Draenei, or Worgen you can get a set of crafted Bottes de la marque sombre and forget a boot design since these boots cover only the foot portion and will not show. The boots i use for this set are Bottes de Volterouille. Not only do they match perfectly, imo, they were a cinch to get as long as you havent already done the quest Gargantapide in Tanaris. If so, there are two other look-a-like items available from Gangrebois and Terres Ingrates quests, Sandales de Grifleur and Bottes en peau de chèvre respectively. Most of which have a few look-alikes. After the removal of many of these items from the game, this the best set up I came up with. The daggers are probably the best match. Epaulières Langue-de-wyrm or the heirloom Epaulières tempétueuses exceptionnelles are identical to the shoulders of this set in case anyone was interested in a different source for them. How odd, the Mistshroud helmet which is listed is mail. Sadly they are cloth, so this will only be for those who want to RP or look cool while in cities. As far as belts go I would also like to suggest using Ceinture de Sofera with the Armure tempétueuse transmog set as it blends really well on Pandaren. Item comparison with the above mentioned Bottes de Volterouille over here. Edited to include item comparison. Also the Scryer Tabard is a perfect match for this set! The colors doesn't match perfectly, but I think Bottes de coureur des marais look pretty good with this set. Good for a Dark Ranger roleplaying outfit. The Cape de l'esprit follet is what I use for a cape, just my two cent. Cloak: Cape de l'esprit follet thanks to Sarenthir for that one! If I find any better matches (especially for the belt) I'll keep them posted. If I remember correctly, this is what Nightslayer (rogue t1) used to look like. Bottes de glisseur works also very good with that set. The stormpike leather girdle is a good fit with this set and easy to get with honor. In fact, the legs and the shoulders can easily be bought with honor points from the Warsong Gulch and Arathi Basin PVP quartermasters respectively at level 60. The Darkstorm tunic from the Hellfire Peninsula quests (for both factions) is an easy way to get the chest. As for the feet, I just use the drag master's boots from the discovery armor set. It lets the coloring on the legs show almost all the way to the bottom, because they're basically slip-ons. Edit: I made a list with all the items I named so you can try out the equipment set I reccommended on your character. Adding any black (or dark) cape to the set is a good way to complete it, imho. Pieces (missing) from this set, are easily interchangeable with the 3rd level of Draenor Crafted Leather gear, . Bottes souples in particular making for the ideal replacement for the now unavailable Bottes de déplacement. I hope this helps. Happy mogging! Bottes de Poil-moussu match perfectly, found mine on AH for my Monk xmog pretty cheap. Hint: If you have done this quest on your main already, just start a Demon hunter and do the quest with it. Another option for the belt, although not entirely perfect, is Beggar's Belt. The LFR version of the Treads of Violent Intrusion are a good replacement for the boots. Bottines de transformation hideuse goes well with the set too.